I somehow read 22 books. *Jaw drops* I knew I read a lot, but wow. That made the following decisions even harder. Don’t be fooled by the title. 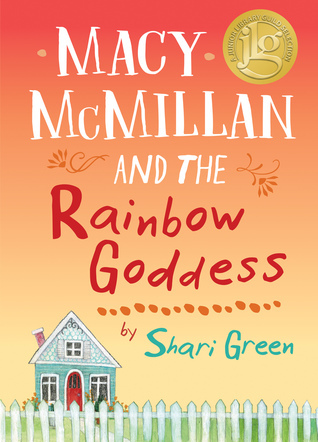 Macy McMillan and the Rainbow Goddess was beautiful! It was one of those books that were written as many poems. It also mentioned books a lot. 🙂 I haven’t heard anything about this book in the blogosphere, but you guys need to read it. I expected to love The Outcasts of 19 Schuyler Place. 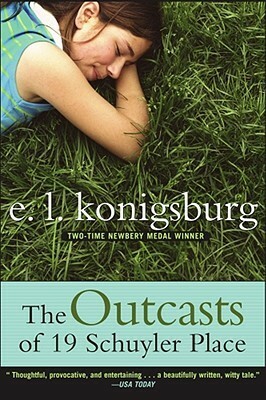 Unfortunately, I found the book jumpy and the characters weren’t as loveable as I would have liked. 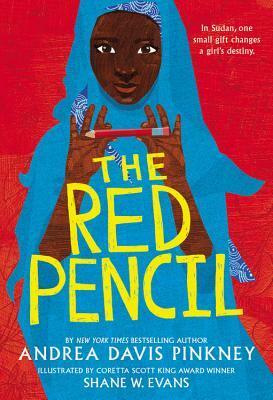 The Red Pencil was also written as many poems. I loved how it gave a look at African culture. It was a very unique read. I also wrote once this month. Not very much at all. BUT, since this month is Camp NaNoWriMo, and it’s Summer, I’m trying to write an entire novel (Typical Rose). Tell me if you all would like to see weekly writing recaps. Guys, I posted a lot more than usual this month, partly because of the HARPS contest and partly because of my blogoversary. I just want to say thank you again for an awesome first year of blogging! My most popular post was my May Chats With Wings. My personal favorite post was my One Year post. This is an amazing piece of artwork. Thanks for the inspiration! The Blog With Wings is a monthly award, here at A Purpose of Winged Dogs. Each month, this award is given to a fantastic blog. For information, click here. June’s Blog With Wings Is…. The Everlasting Library is a book blog started this month by Kerys. Kerys is very funny and I always look forward to her posts. Anyone who reads her blog will have no idea that this is her first month, she is awesome! Kerys, I present to you your award. Feel free to display it on your blog somewhere! I actually did a great job on my goals for this month! This is the section where I talk about my month! First off, school got out, which was great! It means I have many months of Summer ahead of me. I also started off the Summer by volunteering at my church’s Vacation Bible Camp! It was a lot of fun and a great learning experience. Welp, June is officially over. I have many big plans for this blog in July! See you all on Monday! What was your favorite read of the month? Are you doing Camp NaNoWriMo? Thank you, Kerys! Yeah, me too! No problem, you deserve it! Ooo!! Congrats Kerys!!! And I hope you can finish all of your goals!! And, I have some book recommendations for you!! My favorite read of the month was………………*Thinks Hard* Oh!!! Like Sisters book one from AG And Scholastic. I hope I can read book two soon!!! Thank you and thank you for the book recommendation! Oh! And we can do a collab if you like. Thank you! Keep up your reading! Good luck with all your July goals! I hope you have an amazing month. 😉 Also, I’ll check out the blog of the month, it looks so great! Thanks and you too! Yes, please do! Wow! 22 books is a lot! Congratulations! P.S: I love your blog, it’s awesome! Thank you, Madison! You’re very sweet!